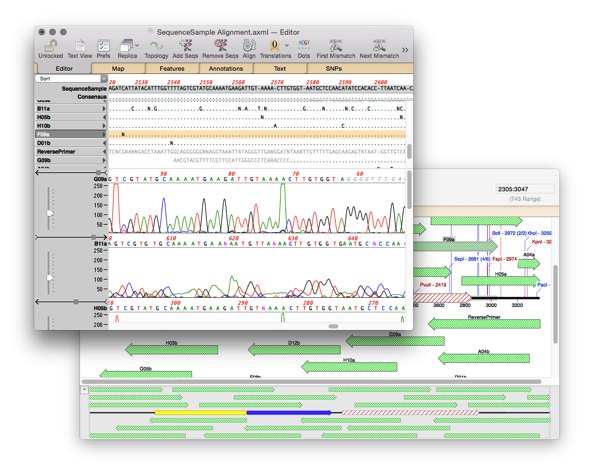 For analyzing large sequencing datasets you need Assembler. However, many times you do not need a powerful tool but just a quick way to check some sequencing data. For example for checking small sequencing projects, such as a site directed mutagenesis, looking for SNPs in a PCR product, cloning a gene or checking your latest construct is correct. MacVector has a built in tool called ALIGN TO REFERENCE that’s specifically designed for such tasks. In the new window click ADD SEQS and add your reads or trace files. Choose the defaults and click OK. The reads will be aligned against the reference and show a consensus. Reads are automatically reverse complemented if needed. Click on the DOTS button to hide all bases that match the consensus, and only show mismatches. There’s also the MAP tab that shows a graphical view of all reads and the reference. You can align against a circular reference too! This entry was posted in Techniques, Tips and tagged assembler, sequencing, weeklytip. Bookmark the permalink. Both comments and trackbacks are currently closed.